I have been a fan of R.A. Dickey for the past couple of years and in fact have had him on my fantasy baseball league team the Rumunners. Sadly, he is not on my team this year. But he now pitches for my favorite team, the Toronto Blue Jays and although he currently has a losing record, has thrown well the past couple of games. Mets knuckleballer R.A. Dickey weaves searing honesty and baseball insight in this memoir about his unlikely journey to the big leagues. 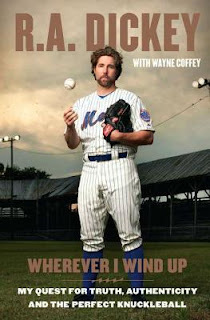 An English Lit major at the University of Tennessee, Dickey is as articulate and thoughtful as any professional athlete in any sport-and proves it page after page, as he provides fresh and honest insight into baseball and a career unlike any other. I really enjoyed this book. It was well written and he is quite open about his life, personal and professional, good and bad and how his faith helped to sustain him. I knew going in that he has deep religious beliefs, and hoped that the book would not be preachy about it. It wasn't. I just found this to be a very honest autobiography, one worth reading.